Spent the good part of a whole day in the internet cafe updating. The excitement came when I was looking for somewhere to sleep. It was raining, and I found a cemetery with high walls and big bushy fur pine trees to shelter under. The rain kept on raining, so I took a stroll in the cemetary while waiting for the rain to stop. 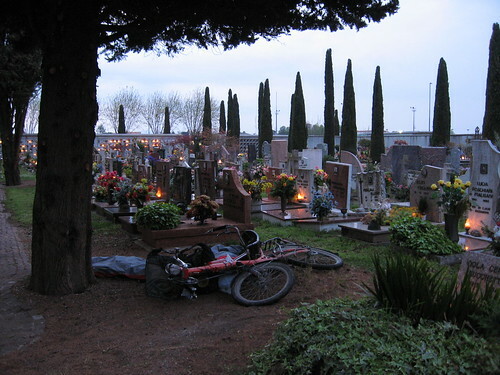 When I returned to my bike, I noticed that the cemetary gates had been locked shut. There was no going back now, I was locked in till morning. The gates were high, as were the walls. No way to get my bike over them. Recent posts really make it sound more like a proper bicycling tour now, as compared to the outdoor survival course you used to be on. With all the media exposure you may find that you are always well looked after for the rest of the trip. Not bad at all. You also seem to have a habit of finding as many caves and cemetaries along the way as you can, which I find hilarious. The pictures are great as always. Sleep well and keep on truckin'! Think that you will find any pizza in Italy better than we used to eat in Yufuin? Chris, it would be a puch to find pizza better than in Yufuin. Man, that pizza was good. But then again, so was the company. Wouldn't be the same eating as good a pizza as that on my own. With all the lights in the cemetery, how does one get a good night's sleep. Kind of pleasant and peaceful atmosphere. At least, the neighbours are quiet! On the homeward stretch now! Take care and look forward to more posts. Are you going to Venice? I highly recommend it. It's so peaceful there. Even though there are hundreds of thousands of tourists, it's amazingly quiet. With no cars, it's like being on another planet. Unfortunately, bicycles are not allowed either, but there are neighboring towns with bus/train service. This entire area is a little pricey though. "We stayed on the mainland in the town of Marghera as you cannot bring bicycles into Venice. This was a good decision as the local buses into Venice are frequent and cheap…"
Oh man, the 'eye of the fish' photo has *got* to feature if you can fit it in somewhere… Was intrigued by its thumbnail on the 'recent photos' tab, even without knowing how it was actually taken. Blog readers and visitors, a few of you with decent incomes might consider sponsoring Rob to make this into a photo/journal book? Maybe? What a book. I'd buy one. Just caught up on your adventures! Sounds like Europe has been a blast and Im glad that you have had some more company. Enjoy the rest of europe and chat soon. …actually this is more of a question than a comment; I'm going to head off on a little cycling jaunt in Korea over golden week, (entering and leaving through Pusan). I checked back over your blog but still havent decided a definite route – any recommendations? I'll be there for either 5 or 7 days. Jim, I am in Venice now. I lugged my bike up the steps to an internet cafe and no one arrested me yet. Trying to find somewhere to sleep. Checking WarmShowers.org and CouchSurfing.org frantically. Might have to sleep on the mainland in a field. Why didn't you just sleep under a bridge in Venice, or were you not to keen on the moisture levels? Ooh, nice idea. A charity that facilitates cross-cultral awareness or cross-cultural conflict resolution would be fitting, based on the misunderstandings you've seen between different people groups so far… Don't know if such charities exist though.